Preservation is continuity of tradition. Tradition is essential to the soul of a nation. It is the past living in the present, and reproducing itself for the future. Pangalay means “temple of dance” in Sanskrit. It is basically pure dancing–without imposed ideas–performed to kulintangan music. In the Sulu Archipelago, pangalay specifically refers to a traditional dance form with flowing movements and rhythmic steps. It is also known as igal among the Badjaw, and paunjalay among the Yakan of Basilan province. Igal is also used as a generic term meaning dance (n.) or a piece of dancing, regardless of function or form.The nomenclature varies, but the similitude of movement vocabulary is the basis of dance identification. Pangalay has the closest affinity to the Asian modes of classical dancing: the Cambodian, Burmese, Thai, Javanese, and Balinese. The basic pangalay movement vocabulary is demonstrated, with a selection of traditional pangalay variants. An energetic Badjaw pangalay variant enlivened by the staccato accompaniment of clappers. Rudimentary dance movements of pangalay playfully accentuated by the use of a fan. The complex version was choreographed by Ligaya Amilbangsa in 1993 and presented at the International Dance Festival in Seoul. A vigorous pangalay variant performed by male dancers mimicking a fisherman’s labors in catching tauti (catfish). Numerous pangalay-style postures and gestures interpret a bird in flight. Ligaya Amilbangsa’s original Linggisan choreography distilled movements from numerous dance performances she observed in the Sulu Archipelago. Codified over two decades of research, these culminated in a cohesive pangalay movement vocabulary specific to Linggisan alone–a complete dance in itself. Conservation is acceptance of the transformation of tradition, the introduction of change while remaining linked to the past. 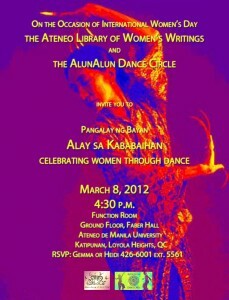 various layers and facets of being a woman demonstrates the versatility of the pangalay tradition. The Tagalog novelty song about courtship became popular in the late 1950s. Rendition by Sylvia la Torre. The femininity and strength of women is conveyed in this simple fan dance. Traditionally performed solo, it is transformed into a group performance to heighten visual appeal. Award-winning composition, music and lyrics by Ananias Montano. Rendition by Susan Fernandez. A lullabye portraying a child’s nostalgic reminiscence of his mother. Composed by Lucio San Pedro, with lyrics by Levi Celerio. Rendition by Regine Velasquez. This folk-rock composition is typical of the Philippine protest music in the 1970s–an era of socio-political ferment when the theme of women’s liberation became an important issue among the progressive sectors of society. Using bamboo clappers, the dancers mimick the movements of the kamun (sea mantis) and the lusay (seaweeds). Music and lyrics by Ramon T. Ayco. Rendition by Inang Laya. A composite of intricate pangalay postures and gestures seen in the traditional tauti, pagkamun, and linggisan. Choreographic innovations create theatrical interest and a lively mood complemented by an upbeat song by Sampaguita. Music and lyrics by Gary Perez. 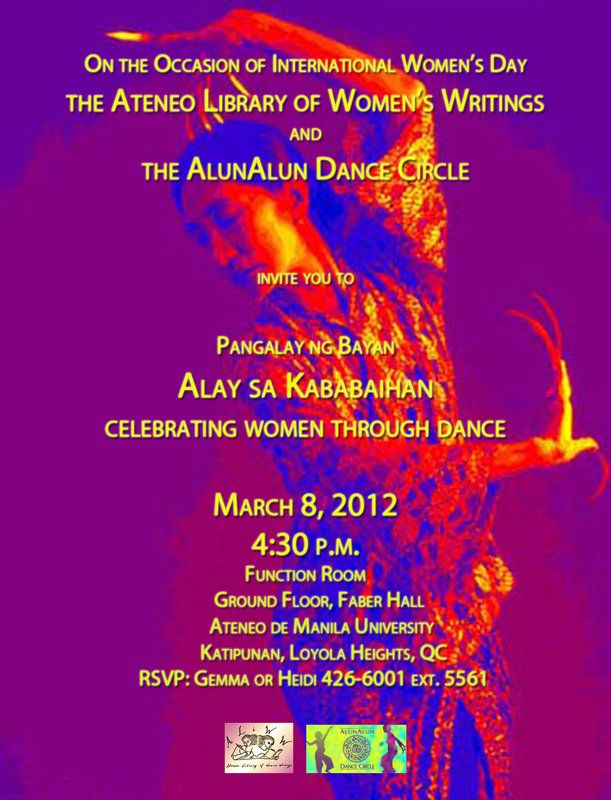 The first batch of memorabilia from Ligaya Fernando-Amilbangsa will be handed over to ALIWW.